Almost every weapon used to close out World War 2 was altered, repackaged and made more destructive to engage in a new war without front lines. Strategically, the 1954 Geneva Accords established the 17th parallel that created a physical division between potential belligerents, but operationally that line was meaningless in Vietnam. Mobility and maneuverability blurred that line and all of Vietnam would become a killing field.The weapons utilized in this war were adjusted to meet the new reality. There are several reasons why the United States did not win the Vietnam War which we will explore in our section on Vietnam War Facts. The quality of its military services, and sophistication of the weaponry, are not numbered among the causes. 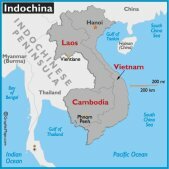 The Socialist Republic of Vietnam is part of the land mass known as Indochina and the southern gateway to the Asian continent. Its northerly neighbor is the People's Republic of China. Between 1954 and 1975, Vietnam was divided into North Vietnam and South Vietnam. During these years, the United States military played a large part in forming its current history. Five presidents, Truman, Eisenhower, Kennedy, Johnson anfNixon furnished military aid to the South Vietnam government. Until the presidency of Lyndon Johnson the aid was limited to some military materiel and a limited number of American military advisers who were dispatched to train the Army of the Republic of Vietnam (ARVN). After 2 of the advisors were killed by Viet Cong guerillas in 1954, the advisers were armed solely as a defensive measure. They were issued the infantry standard 7.62mm M14 rifles. This was an improved Garand M1 used in World War 2. The weapon could be used either semi or fully automatic. The gas system (facilitates reloading in automatic weapons and ejects spent brass) was improved to increase the rate of fire and accuracy. The 20 round magazine was detachable. Manufacturing licenses were held by Thompson Products, Winchester, Springfield Armory. The Military Factory identifies 75 distinct models. How effective were small arms? In one year of the war, 1966, 50% of the American deaths and wounded were caused by small arms, including booby traps, in VC ambushes. Prior to President Kennedy committing more U.S. military advisors, in the early 1960s, a new concept in rifles was introduced by the Armalite Corp. and Colt. Again the gas system was upgraded. The weight was reduced to 6 pounds which reduced the potential fatigue of the infantryman loaded with other equipment. The muzzle velocity was 3,250 feet per second. 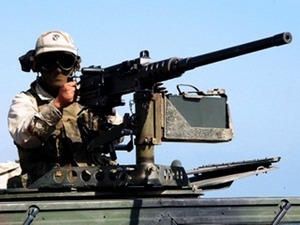 Trials indicated jamming problems and additional changes produced the highly effective M16A1, and is still in use.It was also manufactured in a shorter, carbine model. . 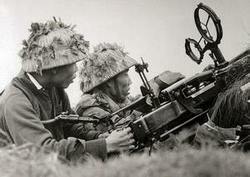 The Viet Minh in the north began arming its military in 1945 when it acquired 30,000 Japanese 6.5 mm weapon. Thereafter, the Viet Cong (VC) and the Peoples Army of Vietnam (PAVN) were furnished more modern small arms from the Chinese and Soviet Russia. 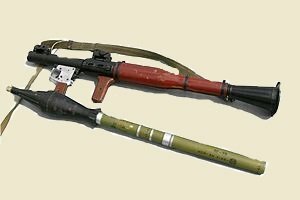 The latter was producing huge stores of the Siminov SKS Carbine. This semi automatic carbine provided a folding bayonet attachment along with a 10 round detachable box magazine. The rifle was easy to handle and had a muzzle velocity of 2410 feet per second. A game changing weapon was introduced by the Soviet Union as the AK 47 assault rifle. Effective and so simple to operate that it required little training. It fit well with the plan of North Vietnam to flood the field with regulars and guerrillas. The Kalashnikov AK-47 is both semi and fully automatic with a 30 round detachable box magazine weighing about 8 pounds. It is named for its inventory in 1947. The muzzle speed was similar to the Siminov SKS. Simple to use and particularly good for the Russian military with its preponderance of former peasants without specialized training. It had no complex parts, and mud and dirt were easily removed. Although not very accurate, it could lay down a deadly field of fire. Kalashnikov would improve the weapons accuracy in the 1970s (AK-74) which the Russians would use in its invasion of Afghanistan. The inventor died in 2014. The modern grenade was a successor to the British Mills Bomb of World War 1. There were two types used in Vietnam: offensive or defensive used by all the belligerents. In some cases, a particular grenade could be used offensively and defensively. The key was the extent of the casualty radius. The grenade is thrown a distance to insure that the thrower is outside of the kill zone. In either case, the purpose was the utilization of a high explosive, anti personnel blast. Fifteen feet radius signified the offensive use (flash and blast), and seventy five feet for the defensive grenade. The former had a flash and blast quality, and the latter for defensive purposes, fragmentation--- flying steel shrapnel. When supply was short, the Viet Cong were resourceful in constructing home made grenades. They often used captured, American unexploded ordnance. Hand held anti-tank grenades were used exclusively by Communist soldiers because it required close proximity to the tank and its blast zone. It was potentially a suicide attack. The Soviet was constantly innovating. They supplied the newly shaped RG 42 which could be thrown further. 1.Chemically filled with a tear gasor white phosphorous to clear Viet Cong from tunnels. Extensive exposure caused an immediate and significant health hazard. This grenade could also be used for screening. The United States was as tecnologically innovative as the Soviets. 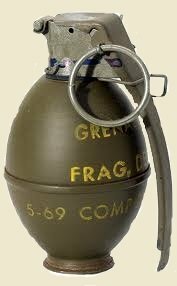 The U.S. MK series was a grenade with a deadly concussive effect for the same "clearing" purpose as the phosphorous. 2.Incendiary used to destroy equipment and burned at 4300 degrees Fahrenheit. 3.Illumination used to light areas up to 600 feet for 25 seconds. Launched grenades were used by all sides in the conflict. The anti-tank and personnel grenades were first used during World War II. 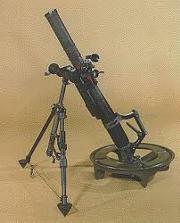 From this weapon, the U.S. developed the M72 effective against light armored tanks. it was shoulder fired. The M79 launcher, also shoulder fired, but was more like a shot gun with a single shot. It weighed 6 pounds and had a range up to 1000 feet. The range significantly covered the area past 30 feet for the thrown grenade and just inside the area fired by a mortar. This M series was quite an effective support for infantry. 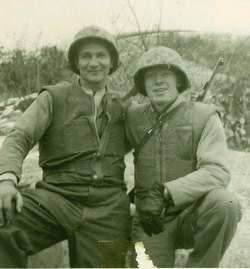 Two were assigned to every 10 man squad and often used in ambushes or counter ambushes. The M79 could be fitted with a light at night to designate a zone for air strikes. 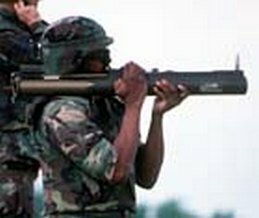 Early in the conflict, the old World War 2 Bazooka was utilized by U.S. marines and the South Vietnam infantry. However. the Americans would replace it for their forces with the M67 recoiless rifle. It was 54 inches long and weighed 13 pounds and easily carried by an infantry man. It fired a shaped charge and was armor piercing. 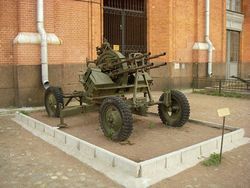 The communist forces relied on the Soviet RPG rocket propelled grenade launcher.This anti tank gun fired up to 6 rounds per minute. 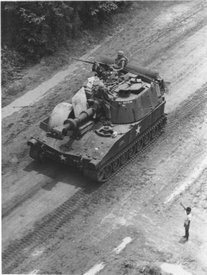 The gun was operated with a motor that issued black smoke when fired which was an invitation for return fire on the identified location.Their intended tank targets defeated the grenade attacks by erecting cyclone fences around a defensive perimeter. 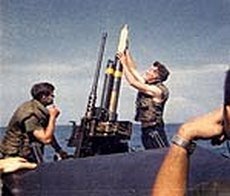 By 1972, the guided missile became the anti tank weapon of choice.It was only 38 inches long, weighed 15 pounds, with a range about 1000 yards firing an 85 mm projectile. The low flying propeller operated planes and multi tasked helicopters integrated with the infantry required counter measures from the enemy. The response was the shoulder fired Russian SA-7 system (Strela). Depending on which side is more credible, the number of kills against aircraft ranged from 50 to 200. The United States did not field a shoulder fired surface to air missile. Their air force controlled the sky. 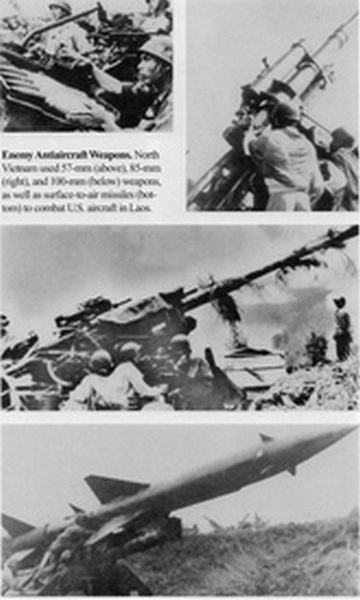 In 1972, the NVA also used wire guided missiles. 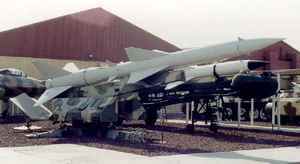 It was evident that the shoulder fired SA-7 would not solve the problem of the United States control of the air. A more formal build-up of an air defense system was imperative for North Vietnam. In 1965, the Soviet Union, the implacable Cold War enemy of America, introduced a partial solution. 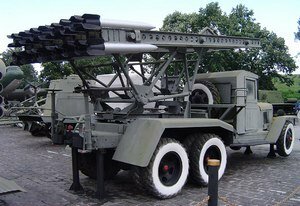 They had continued to manufacture the SA-2 (SAM) that they used against Germany in World War 2. They installed 150 sites with 50 rotating SAMs in North Vietnam. They also furnished the skilled Russian gunners. Particular attention was given to protecting Hanoi and the port city of Haiphong. The rocket installations were added to a strong complement of anti aircraft guns (AA). Six missiles were maintained on the launcher which could be anchored to the ground or loaded onto a van. The Fan Song guidance radar system could detect enemy aircraft in a 70 mile range. The system could guide 3 missiles to a single target. The rocket, actually designated as the S-75 Dvina, weighed almost 5,000 lbs.with a 3.5 mach speed. It's range was 20 miles with a ceiling of 5,000 feet. The first fruits of the Sam system was on July 23, 1965. A U.S. navy plane was shot down over North Vietnam. Vietnam was barely conducive to tank operations. Vast swaths were mountainous and/ or jungle. How dense was the jungle? The U.S. air force encountered three levels of canopies. The U.S.armored and cavalry services had a large reserve of serviceable armor from earlier wars. Only the Patton 48 series operated efficiently in the hostile terrain. It was dubbed the "jungle buster". When mounted with a bulldozer frontal plate it could blaze a trail for the following infantry men through the dense underbrush. The tanks operated in battalion strength. Usually 57 tanks per unit. Tactically they operated offensively and defensively. Offensively they led and carried troops into an attack. They were used to grind down Viet Cong bunkers. They hooked claymore mines to a blade when engaged in sweeps and ambushes. The shock effect from their guns made the tank a target for the enemy who sought to destroy the tanks at every opportunity. Their heavy armor resisted most RPG attacks. The tank mounted a 105 mm cannon and heavy Browning machine guns. Six hundred Pattons were used in Vietnam. They were initially used by the 1st and 3rd Marine Tank Battalions. They also utilized the M67 flame thrower mounted on the medium Patton tank. The marines referred to the gun as the zippo" after a well used cigarette lighter. 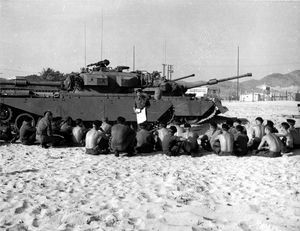 The tank units saw service near the DMZ (17th parallel) with the 79th Armor, the 69th Armor in the Central Highlands, and in the south, in the Mekong Delta area with the 34th Armored Battalion. In its defensive mode, the Patton, was stationed around the perimeter of a fire base. Their greatest threat was the satchel charge which was dropped onto the stationary tank. The tank crew developed a strategy to combat this attack. They called it "back scratching". While a strike on a tank was subjected to a grenade or satchel attack, the nearest, companion tank would fire their machine guns at the exposed attackers. Fire base activity ranged from malaise to frenetic in the space of hours. Their movements were constantly watched by the enemy in territories that were controlled by the Viet Cong at night. Their efforts at pacification of local villages were always threatened by ambush. In short, the stress was unrelenting and ever present. 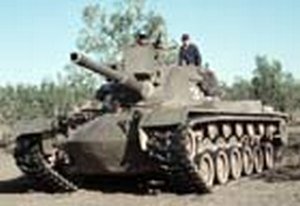 The tanks were utilized almost exclusively to support infantry actions.Tank versus tank battles, as were common in World War 2, were uncommon in Vietnam. There is one reported incident in 1969 at Ben Het involving the NVA's 69th Armor using about a dozen Soviet PT 76 tanks to support a large body of NVA troops. Their tanks mounted 76.2 big guns and engaged the beseiged camp through the night. The Americans with their Montenard Highland allies were dug in the Ben Het Camp about 7 miles from the Cambodian border. Their perimeter was stretched thin as they were supported by only three tanks in addition to their artillery battery. The Americans repulsed the attack and lost two of their tanks. They confirmed an equal number of destroyed enemy tanks with evidence of damage to others. In 1972, the north commenced their Easter Offensive. Their infantry was supported by 100 tanks in its attack on An Loc. The south's ARVN forces were armed with the American M72 anti tank weapons (above) and destroyed 80 enemy tanks. When the American forces signed a cease fire agreement with North Vietnam January 1973, the enemy already controlled a large swath of the south. 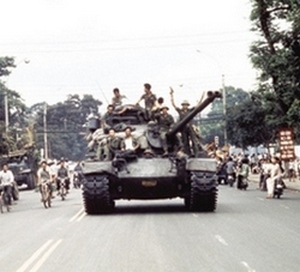 The U.S. bequeathed many of their tanks to the South Vietnam military. The north was not deterred and continued their advances toward the South's capital in Saigon (Ho Chi Minh Offensive). 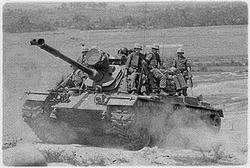 By 1975, Congress cut off aid to South Vietnam which meant no gas or ammunition for the tanks. The North now used their tanks to rapidly advance south running over the ARVN defenders and ending the struggle when they entered Saigon April 30,1975. Although the NVA had a modernly equipped ground force, supply was a problem when they operated in South Vietnam. Roads were under sky observation and air strikes were a constant threat. 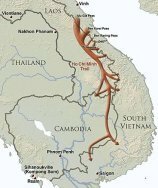 The NVA solution was the utilization of a system of paths and trails that stretched from North Vietnam to the southern end of south Vietnam. This mainly dirt track consisted of hundreds of trails that straddled the mountain and jungle borders of Vietnam, Laos and Cambodia. 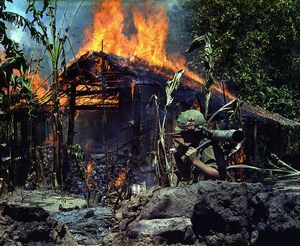 The latter two countries were reputedly neutral, but were not immune from probing American patrols issued from near by fire bases on the Vietnamese side of the border. 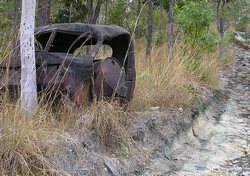 American bombers dropped their loads on neutral areas when attempting to interdict troops and war materiel.The paths were strewn with burned wrecks. 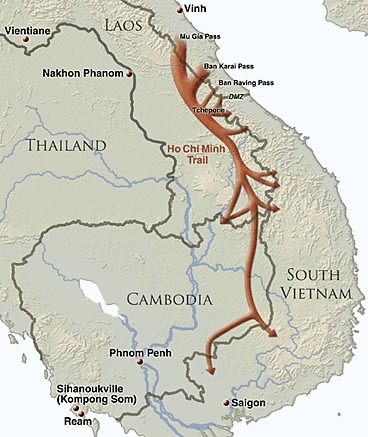 The North Vietnam home front efforts included use of the the Ho chi Minh trail that was named for the president of the country. 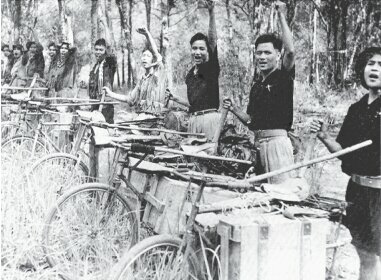 The services of all ages were utilized including the bicycles of the NVA Transport corps. Each rider could move hundreds of pounds along the trails. . Flak jackets were introduced to the United States Army Air Force in 1945. 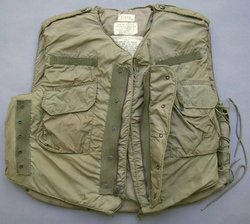 Later technologies refined the protective gear for the marine and army infantry that protected chest, abdomen and back from small arms fire and grenade fragments. By 1962, protective cover was extended to the neck. The garment weighed about 10 pounds. The outerwear was either full jacket or vest. In the air service, gunners wore full body armor and pilots only frontal protection. The inner surface was a composite of aluminum oxide and ceramics. Leg armor was formed in steel. Weight of the full armor was about 25 pounds.The M52 vest contained 2 rows for hanging grenades. For river patrols, floating armor was made of a composite of titanium and nylon. The jacket was impervious to flechettes used in underwater small arms. The United States had built, but never used, a supply that carried biological chemicals. Although body armor is a minor niche in the study of weaponry, its history is enlightening as a microcosmic study of weapon development. Each evolution takes years of scientific research, and each step requires getting the technologists on board. Then begins the slow grind to transfer the theoretical to the practical application. The threat of violence, or war, has always galvanized technology, be it primitive or modern, to create weapons with greater destructive power than those in the arsenal of the enemy. In counter point, there is always pressure to defend against those weapons. The progression of "bigger and better" is a basic tenet of weapons history. As the velocity of a bullet increased its penetrating power, preserving the lives of those on the battlefield also gained importance. The need for a solution was prioritized. We noted, above, the 1945 solution to protect pilots, trained at great cost, and highly vulnerable to career ending wounds (or worse), stimulated industry to "invent" an answer to the problem. One such breakthrough occurred with the development of Kevlar. It began in 1965, when a DuPont research scientist, Stephanie Kwolek succeeded in synthesizing a stiff-chain polymer solution that spun into a fiber that was 5 times stronger than steel at equal weight. The hurdles to develop a practical approach to commercialization were scientifically staggering. Efforts continued for several years until an economically feasible process was developed. During that period a parallel research effort was aggressively pursued to identify end-use applications for Kevlar, including bullet resistant vests. A shooting range was constructed, and new body armor was born. Then the ball was handed to the engineers for design, and ultimately the construction of a special plant in 1982, with an expenditure of almost one-half billion dollars. In the Vietnam era. we found that innovative technology could increase the protective power of body armor. But the military inherently sought the next, more destructive weapon and, hence, the next best defense. It is now commonplace to find that industry is no longer bound to the status quo, and their scientists, engineers and technicians continue to experiment to create the next generation of weapons. We were fortunate to elicit the following information from David Tanner the scientist who directed a team effort over a number of years to improve body armor. "In the 1970s, a team of scientists and technologists at DuPont, were able to use a synthetic fiber to reinforce helmets and vests. 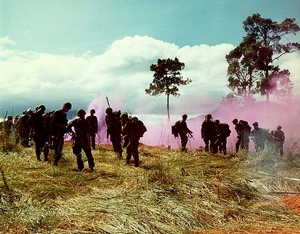 DuPont had developed "Kevlar" during the early years of the Vietnam War. Kevlar fiber is 5 times stronger than steel on an equal weight basis. This enabled development of light-weight bullet-resistant vests that are comfortable enough to help improve mobility and reduce fatigue for soldiers in the field. Kevlar fiber is also inherently flame resistant, helping to provide thermal protection from blasts and fire". The military was prepared for the First Gulf War. Examining grenade's blast effect on Kevlar helmet. The big guns, cannon, were integral to the infantry operations of the Americans. In contrast to the air force bombers, their ammunition was more diverse, their firing more sustainable, and most significantly, more accurate. Their arsenal, common to most armies included direct and indirect firing guns. The direct uses guns with a longer barrel and greater range, and the indirect, a shorter barrel, producing an arcing trajectory and shorter range. Generally, each U.S. division depended on a battalion of direct fire support per brigade and a battalion of general artillery per division. Artillery fire doctrine was in play. It relied on maneuverability (movement to gain a combat advantage) and fire power (destructive force). U.S. forces in Vietnam relied on 68 artillery battalions supporting 93 maneuver battalions.Their ARVN ally had 44 battalions of 105mm howitzers. An additional layer of complexity was extant in Vietnam. The artillery was no longer the only source of fire power. The utilization of air power, fixed and rotary wing used by each service, (army, navy and marines) required integration and synchronization. Nevertheless, artillery fire was most feared by the enemy. Their responsive tactic was referred to as "hugging". The enemy would lie in areas close to the U.S. ground troops to avoid the shelling. Every response was met with counter measures. A "cordon" was formed by assault helicopters to encircle the enemy and formed a perimeter to surround the enemy. Essentially, herding the enemy. Then the big guns would do their work. In the early years of the war, military planners believed that these methods would wear down the enemy by attrition through similar tactics. Unfortunately, the mind set of the enemy was "never give up". Factually, attrition was the enemy of the United States. This was a war in which the Americans controlled the air and, judging results, their artillery was not effective enough to produce long term victory. In earlier wars, the rule was that the artillery was most effective when firing in mass. However, in Vietnam, there rarely were massed targets. The need for forward observers to identify targets was extremely important---and dangerous duty. Some of this duty devolved to helicopters. Then there were other considerations before firing on a target. When civilian populations were in the target area, artillery paused to await a decision from the sector HQ. Often that decision would take up to an hour to deliver a response. By that time, the enemy had dispersed. In Vietnam, most of the U.S. long guns were mounted on their tanks. However, the U.S. arsenal carried a variety of heavy howitzers and mortars which were either self propelled or towed. Some like the M102, 105 mm howitzer, could be air lifted to forward lines by the Boeing Chinook Ch-47 helicopter. Howitzers were also mounted on tanks. 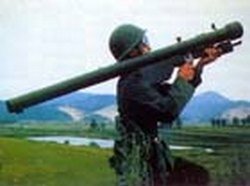 These newly designed guns arrived in Vietnam in 1966 not only adding destructive power in zones not covered by long barreled guns, but added mobility with the ability to traverse 360 degrees. A definite improvement over the M101A that had also seen service in Korea. Technology repackaged the basic high explosive (HE) shell that had been used in earlier wars. The fire bases manned by Americans relied on anti personnel shells. Often their fire was directed point blank at the charging enemy. Canister shot was also used by the big guns. 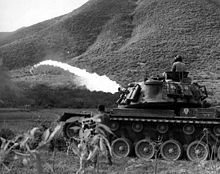 The Arvn were also supplied with heavy weapons that approximated those of their American counterparts. These included the much utlized 105 and 155 mm howitzers as well several types of self propelled howitzers. 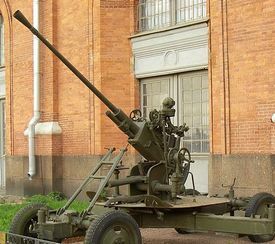 The M1939 37mm was the work horse of the north's air defense. It was an automatic firing weapon weighing about 4600 lbs and capable of traversing 360 degrees. The larger S-60. 10,000 lbs required a 7 man crew. Its firing power was critical at lower altitudes between 1200 feet and 4500 feet. The Russian 85 mm was a large 10,000 lb gun with 360 traversing mobility. Its vertical range was 34,000 feet. Another soviet weapon was added to the defense of North Vietnam. 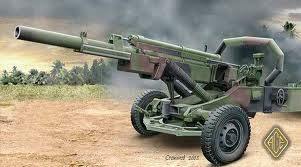 The ZU-23 twin auto cannon. The 23mm caliber was manually operated and loaded. However, it was quite nimble and easily moved. Its range was 2 miles. The majority of the guns on both sides of the line were mortars ranging from light to heavy. The latter ranged from 120mm to 300mm. 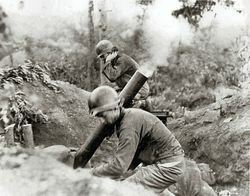 American fire bases were subjected to nightly mortar attacks from light, portable mortars such as the Chinese 55mm below. Each American base had gun pits for at least one battery, and the camps were protected by at least 25,000 sand bags. There is a general belief that no fire base was ever overrun by the enemy. The American defenders were as fierce as the enemy. The VC were almost entirely dependent on mortars and rockets and had no conventional artillery. Any larger weapons in their possession were acquired from captured ARVN arsenals. These included U.S. 75 mm howitzers. On the other hand, the regular PAVN army were stocked with Russian and Chinese guns. In the final years of the war, They moved 400 big guns as their regular troops advanced south.These included 122 and 155 mm field guns as well 82, 107, mm mortars. The PAVN mainly relied on the 130 and 152 mm howitzer as well as the big 155mm towed howitzer. The katyusha rocket was introduced by the Soviet in World War 2. This surface to surface weapon became a mainstay of both PAVN and their southern guerrilla ally, the Viet Cong. Initially the 2 man crew operated the BM series 122mm resting on a primitive base. As the war proceeded, they were supplied with light, medium and heavy rockets and truck bases to increase mobility and stability. This rocket was not designed for accuracy and used for area damage. In an attack on the American base during the enemy Tet offensive (1968), the enemy attempted to take out hangars and run ways.Their rockets struck a hospital hundreds of yards away. An interesting comparison found that in the first Indochina war (1946-1954) in 1951, the French fired one-half million rounds. The VC defeated the French at Dien Bien Phu by firing 2,000 rounds per day. In 1969, the United States fired 10,000,000 rounds in Vietnam. As was the case in all modern wars to date, the machine gun occupied an all important niche in the belligerents arsenals. They were mounted on boats, tanks, helicopters, fixed wing planes, and in the case of the U.S. and ARVN infantry a staple in every squad. 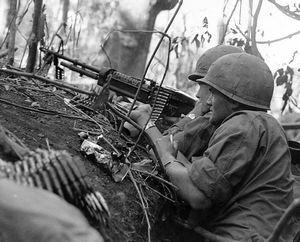 Most significantly, machine guns like the M-60, a general purpose weapon (GPMG), were basic elements in U.S. and ARVN infantry squads. The M-60 came in several models including light and medium. 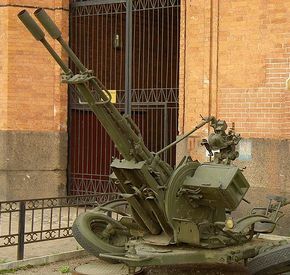 This 7.62 mm gun was the infantry's main fire power in Vietnam. The gun was gas operated, air cooled and belt fed. Its effective range is 1200 yards. The gunner in the squad lugged 23 lbs and added 15 lbs more if used with tripod. 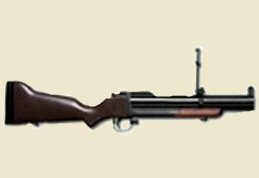 Prior to the introduction of the M60, the M1921 .50 caliber Browning, successor to the M1918 and 1919, was widely used in Vietnam. A powerful gun that could fire a 12.7mm cartridge. When it was used in action in Vietnam, with its various improvements, it was known as M2HB. The gun was water cooled and with the water cooling jacket weighed 121lbs. It required a crew of seven---mostly used to carry the gun. Water cooling was a liability after rapid fire of 75 rounds. Although built to fire up to 600 rounds per minute, it often overheated the barrel. The high velocity could pierce armor. Ultimately, with an improvement that made the barrel heavier, and adding a quick change extra barrel to overcome the heating problem, the gun was extremely serviceable. 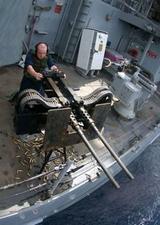 The gun was effectively used on boats, tanks, and planes from World War 2 and well into the Vietnam conflict. Weapons historians have identified over 20 types of machine guns, and as many models of sub machine guns, used by the NVA and VC. The guns ranged from light to heavy. The Degtyarov a light, general purpose gun was a gas operated 7.62 caliber weapon. It could fire 500 rounds per minute with a range of 2400 yards. It weighed 20 lbs and was loaded with 47 rounds from a circular pan. It was also equipped with a flash suppressor. The RP 46 was a heavy general purpose gun fed with a 50 round belt and considered comparable with similar American guns. 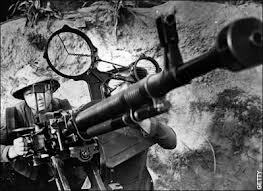 The NVA employed the same flexibility as the Americans in adapting the machine gun to diverse platforms. The guns were not only used by their infantry, but utilized as anti-aircraft weapons.